Send our Mouthwatering Strawberry Cake Gift to your dear ones and savor their taste sensations in a startling way. This Fresh Baked 1 Lb Cake is beautifully embellished with dollops of white cream. 1 Lb Strawberry Cake.Pamper the taste buds of the recipient with this freshly baked delicious, lip smacking strawberry flavored cake which is nicely garnished with dollops of whipped cream. 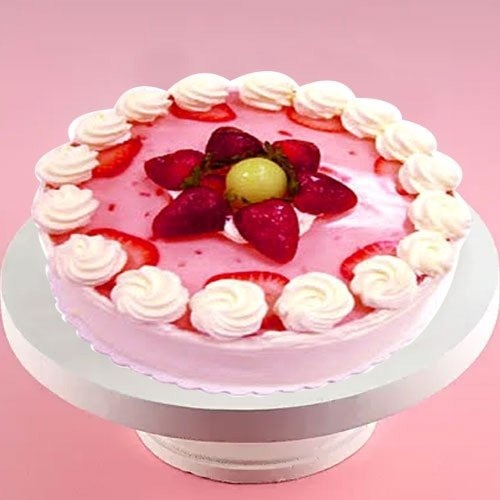 1 Lb Strawberry Cake with Single Rose.Pamper the taste buds of the recipient with this freshly baked delicious, lip smacking strawberry flavored cake which is nicely garnished with dollops of whipped cream. 2.2 Lbs Strawberry Cake.Pamper the taste buds of the recipient with this freshly baked delicious, lip smacking strawberry flavored cake which is nicely garnished with dollops of whipped cream. 4.4 Lbs Strawberry Cake .Pamper the taste buds of the recipient with this freshly baked delicious, lip smacking strawberry flavored cake which is nicely garnished with dollops of whipped cream.